Iceland's Johann Berg Gudmundsson is gunning for England again at next summer's World Cup and would be confident of scoring another famous victory. Burnley winger Gudmundsson was part of the side which bundled the Three Lions out of Euro 2016 with a shock 2-1 win in Nice and is already dreaming of a rematch in Russia. "Hopefully we'll get them in the group phase," said Gudmundsson. "It was a great game for us last time and I believe we could beat them again. "I'm not expecting - and hopefully you're not - for England to win the World Cup...maybe you are. But I think they should be doing a bit better and hopefully they can do it in the next World Cup - as long as they don't meet us." The 26-year-old is in his fourth year in English football, starting at Charlton and now across two Premier League campaigns with the Clarets, and sees at close hand the curious culture surrounding the national team. While Iceland's recent achievements have been met with delirious excitement at home - not to mention the Viking 'thunderclap' which soundtracked England's downfall in France - qualification with a game to spare comprehensively failed to rally fans to the cause on these shores. "It's a weird one," said Gudmundsson, who will come up against England keeper Joe Hart when West Ham travel to Turf Moor on Saturday. "The pressure on England is much more and I understand that. They have much more expensive players than we do and they haven't done as well as they should for a long time. "So obviously the media, people are on at them, wanting more. You read it in the media, they always come back to that game 'the Iceland humiliation'. "But luckily for us there is no pressure. 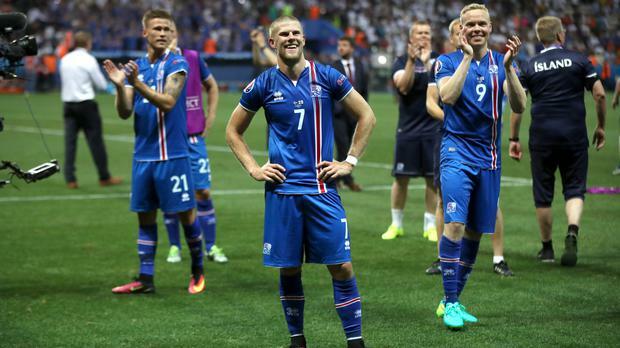 Iceland is a much smaller nation - also on a footballing level. The higher you go up the scale the more pressure there is. "They should be doing a bit better but they won the group comfortably so you can't be too hard on them. It's about what they do in Russia now - when it matters on the big stage in. That's when you have to do well."